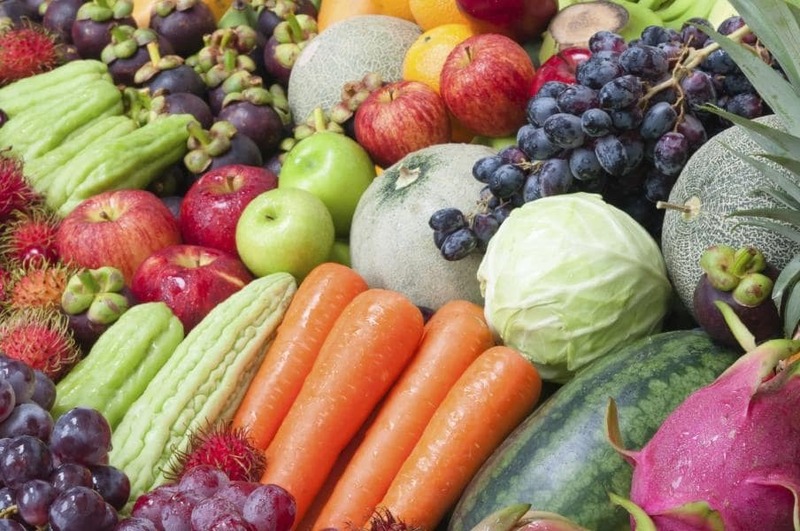 Have you ever heard that it is important to “eat a rainbow” of foods? This may be a good way to think about your diet because numerous functional foods can be recognized and grouped together by their color. Functional foods are foods or dietary components that may provide a health benefit beyond basic nutrition. Examples can include fruits and vegetables, whole grains, fortified or enhanced foods and beverages and certain dietary supplements. This fall, dive into the color of the various functional foods listed below and unlock the health benefits that may already be on your plate. An easy way to get more functional foods on your plate is to fill half of your plate with some of the colorful fruits and vegetables mentioned below. Whether you think of a blazing fire or an early morning sunrise, orange and red are two of the most vibrant colors in the spectrum. Orange foods such as carrots, pumpkin, sweet potatoes, squash, and cantaloupe, include a plant compound known as carotenoids. Carotenoids include beta-carotene, which is converted into vitamin A in the body. Vitamin A has many roles within the body: it helps support the function of white blood cells (which is important for a healthy immune system), promotes bone growth, and helps to regulate cell growth and division. Vitamin A and two other types of carotenoids, lutein and zeaxanthin, are also important for healthy vision. Also a carotenoid, lycopene is found in red foods such as tomatoes and tomato products, watermelon, and grapefruit. The main benefit of lycopene is the maintenance of prostate health. Try new veggies such as bok choy, mesclun, turnip greens, kale, or watercress while revisiting some old favorites like broccoli, collard greens, romaine lettuce, and spinach. This will put you well on your way to the recommended 5 servings of fruits and vegetables per day. Dark green vegetables are a functional food component powerhouse! Included in the long list of nutrients found in these veggies are potassium, dietary fiber, folate, vitamin A, vitamin E, and vitamin C.
It may seem like a stretch to group these colors together, but humans have been doing it for centuries! Before conventional methods of dying fabrics, berries and teas were used to color the finest hand-woven fabrics for royalty. Now that these foods are no longer needed to color clothing, foods that are blue, purple, crimson, and even brown are gaining popularity due to the fact that they contain flavonoids. Berries, cherries, red grapes, red wine, dark chocolate, cocoa and some teas are good sources. Flavonoids are beneficial to our health because they may contribute to the maintenance of proper brain function and blood flow. Tan is not usually the most exciting color in the spectrum, but tan colored foods still come packed with many health benefits. Whole wheat breads, cereals, and pastas that are higher in fiber are usually tan in color. The insoluble fiber found in wheat bran, corn bran, fruit and vegetable skins, and whole grains may contribute to the maintenance of a healthy digestive tract and reduce the risk of some types of cancer. Another type of dietary fiber is called beta glucan. This component can also be found in tan foods such as oat bran, oatmeal, oat flour, barley, and rye. Beta glucan-containing foods may reduce the risk of coronary heart disease. Just because a food is white, doesn’t mean that it isn’t nutritious. In fact, white foods such as low-fat (1%) or fat-free milk, yogurt, and some cheeses are packed with vitamin D, calcium, and phosphorus. These vitamins and minerals aid in bone health and may help us maintain a healthy body weight. Yogurt also contains probiotics, which are bacteria that confer a health benefit, like promoting digestive health or supporting immune function. The Dietary Guidelines for Americans recommends getting three servings of dairy products every day. When you think of yellow foods, fat may not be the first to come to mind, however, after considering butter, margarine, olive oil, and vegetable oil, yellow is a common thread! Recent dietary guidance recommendations suggest that the type of fat that you consume can affect your health in various ways. While it is important to consume a diet that is low in saturated and trans fats, certain types of unsaturated fats such as linoleic acid (an omega-6 fatty acid) and linolenic acid (an omega 3-fatty acid) are essential for life and have to be consumed through the diet. These fats are important for proper growth in children, healthy skin, and to help regulate cholesterol. Fat is also needed for transport and absorption of fat-soluble vitamins A, D, E, and K, as well as carotenoids. Research continues to tout the benefits of omega-3 fatty acids to help reduce the risk of heart disease and promote brain health and vision. Two examples of omega-3 fatty acids include eicosapentaenoic acid (EPA) and docosahexaenoic acid (DHA). Oily fish from cold waters, such as salmon, mackerel, tuna, and trout are especially rich in EPA and DHA. You can also find DHA and EPA in certain fortified foods and beverages and dietary supplements. Just by remembering to “eat a rainbow,” you can increase your intake of nutrients and healthful food components. So, the next time you reach for one of the above mentioned foods, remember that it is not only bursting with color and flavor but that it also contains a component that may improve your health.